Use a knife to cut small slits in the lamb. Place a garlic sliver in each slit. In a small bowl, combine olive oil, lemon juice, oregano, salt, rosemary, and pepper. Brush lamb with this mixture. 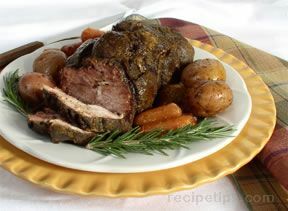 Put lamb into roasting pan. Cover and refrigerate 24 hours. Set aside remaining basting mixture. Bring lamb to room temperature. Heat oven to 325. 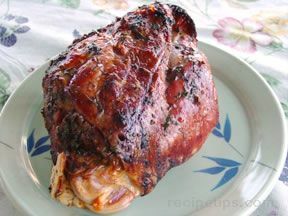 Roast lamb for 1 hour (30 minutes for a smaller leg). Drain off any fat. Put hot water into the pan. 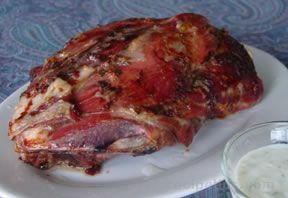 Continue to roast lamb, basting every 20 minutes, first with remaining basting mixture, then with juices in the pan. Allow 20 minutes per pound, or until meat thermometer registers 140 for rare, 160 for medium, or 170 for well done. Remove from oven, cover lightly with foil and allow meat to rest 20 minutes before carving. Skim fat from juices and serve pan drippings with the lamb.